You guys already know that I love my quinoa. Something that you may have not known is I love the taste of sweet and savory together. 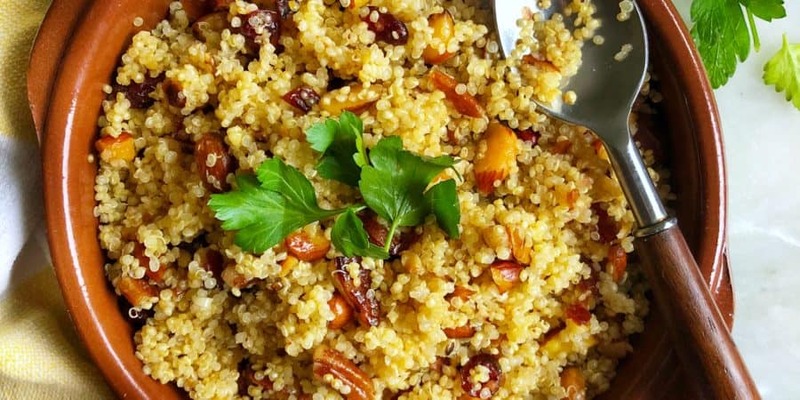 So, this quinoa salad definitely hits the spot! You get the tanginess and sweetness from the cranberries yet the savory from the pecans and olive oil. 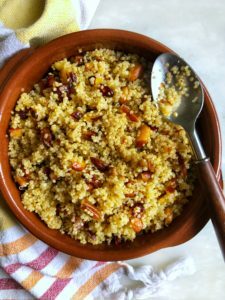 It’s such an easy side dish to make especially for Thanksgiving day since you can make this days ahead of time and just keep it in the fridge sealed well. Rinse the quinoa and drain. Add them to a pot with 2 cups of vegetable stock. Bring to a boil then keep it covered on a simmer for about 12-15 minutes till cooked perfectly. Make sure to fluff and stir the quinoa occasionally. *Instructions for cooking is also on quinoa package. In a small bowl, mix together the fresh lemon juice, olive oil, salt, pepper, garlic powder, mustard, and honey. Once quinoa is cooked, add the dressing to it. In a pan, saute the pecans till lightly browned in some olive oil or butter. Season with Salt & pepper. Add that to the quinoa as well as the dried cranberries and mix everything together well. Add more salt and taste. Garnish with sliced green onions and parsley.